Now in this version of Drupal 8 if we click the dropdown button we can delete core views, and this is something that I think is likely to be fixed soon but the way that we would guard against accidentally deleting a core view is the same process that we'd go through to protect any of our configuration from deletion or from problematic adjustments, and that's by using the configuration management. Configuration management in the case of Drupal means to take configuration that's normally stuck in the database and export it into code and be able to import it later back into the database. 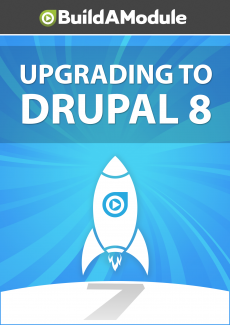 In Drupal 7 most people use the features module to accomplish this. Now Drupal 8's configuration management is a bit simpler than features in that we can't create bundles of configuration we can only export everything or export one thing but not group things together as bundles. So to do that same way you'll probably end up using features in Drupal 8, but out of the box we do have a way to at least capture our configuration in code as a backup and a way to version control our configuration if that's what you need to do. So let's take a look at how to do that.